Damai I is one of the Damai Fleet boats, that combines experience and traditional atmosphere of Indonesian boat. Damai I has 7 cabins on board. Lower deck cabins equipped with double bed or with transforming bed, that can serve for a double occupancy and twin occupancy as well. There is also a large stateroom placed on the main deck, that has also transforming beds. And the biggest cabin is placed on upper deck. It has big portholes to enjoy the view and a direct access to the sun deck. Boats salon is comfortable to relax in between dives or to discuss diving day in the evening. Also, there are two sun decks where you can get some tan and enjoy marvelous marine scenarios. Damai has a message area what, makes safari with this boat perfect for relaxing. Dive deck of Damai I is situated on the main deck. Divers can use a camera table here with several charging points to maintain equipment after dives. Safety is one the main priorities of Damai I crew. Boat equipped with first aid kit, life vests, and emergency rafts. Damai I equipped with special facilities for photographers. She has a camera room with a table, where you can comfortably work with your photo equipment. Also, Damai I run world's most colorful routes. Pictures that would be done during the trip will be picturesque. You can also, capture some unique marine creatures like big mantas and whale sharks. Damai I offers a variety of Indonesian itineraries. 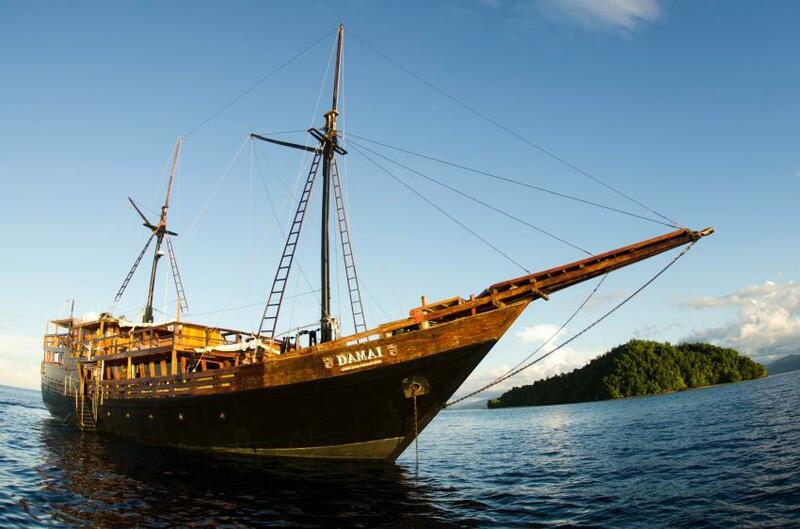 This boat visits famous Komodo, Forgotten Islands, dive sites of Raja Ampat and Alor. Raja Ampat dive sites are represented by the biggest amount of marine creatures in the world. There is numerous of coral species and mollusks here. Plus you can dive with mantas and turtles, get a chance to see Damai I wobbegongs, one of the rarest sharks in the world. For Komodo Islands sunfish, mantas, dolphins, eagle rays and pygmy seahorses are common visitors. Of course, these Islands are well known for Komodo dragons, large lizards that live here. Diving in Indonesia is possible all year round. There is the best time to visit each destination that Damai I offers. For Komodo, it’s April, Raja Ampat best season is during the months of October until the end of April. Chances of meeting famous Indonesian fish Mola Mola is better in August. Mantas are regularly seen from October until April.